It is very sad news that the American violinist Ida Levin has lost her battle with leukaemia. Ida was devoted to the International Musicians’ Seminars in Prussia Cove, Cornwall. I met her there when she came to study with Sandor Vegh. He immediately liked her and her playing. She in turn instinctively understood his middle-European conviction about the importance of music, particularly chamber music, and she championed his beliefs when she was back home in America. Through the following years I played with Ida in various different groups during the autumn chamber music seminars. She remained faithful to Prussia Cove even when she was very busy with her career in the US. 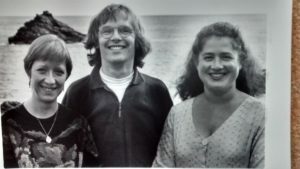 For a while, we thought we might ‘make a go’ of a wonderful trio we had with the cellist Christoph Richter (see 1995 photo of us at Prussia Cove – Ida is on the right) but practicalities intervened: Ida lived in Los Angeles, Christoph at that time in Germany, and I was in London. The trio faded away, but I enjoyed playing with Ida in those years when we could both manage to get to Cornwall in September. I played with her in a quintet on her last visit to Prussia Cove a couple of years ago. On the day of our concert, she said she felt rough and wondered if she was coming down with ‘a terrible Prussia Cove cold’. It turned out to be something worse. I was always struck, as everyone must have been, by Ida’s tremendous energy, determination and drive. She was a woman of strong opinions backed up by formidable amounts of research into whatever it was that interested her, from vegetarian diet to politics to which airline one should trust. She was funny, feisty and had great charisma. Her character was perfectly expressed in her playing: strong, warm, intelligent and well-informed. As time went on, she became a terrific mentor to many young musicians, for whom she went the extra mile in a selfless way. When she became ill we all realised that she had great personal courage as well. It is a tribute to her personality that she inspired a ‘support group’ of half a dozen friends who went to extraordinary lengths to look after her and keep her company during various phases of her treatment. She will be greatly missed. This entry was posted on Sunday 20th November 2016 at 11:24am	and is filed under Concerts, Musings. You can leave a response, or trackback from your own site. Thank you for those beautiful memories of Ida. I knew her too, and played with her on a couple of occasions….a great musician and wonderfully natural violinist. She will indeed be greatly missed. I am saddened to hear of Ida’s passing. She was a cousin by marriage. I heard her magnificent playing at the Metrpolitan Museum a few years ago. I also visited her in Vermont one summer. She leaves a legacy of great violin playing , a devoted mother, a good friend, a mentor to many.